MidAmerican Energy Company will include for the first time a concrete turbine tower at its new wind farm in Adams County in Iowa. Photo source. MidAmerican Energy is planning to build the tallest land-based wind turbine in the country in Iowa. 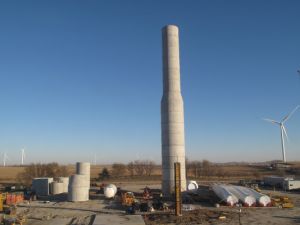 According to todesmoinesregister.com, the Des Moines-based power company will get the added height by building the wind turbine tower from concrete instead of steel, a first for the company. The extra 100-plus feet enables the turbine to capture more wind energy, the utility said. “Generally speaking, the higher the altitude, the greater the wind resource available,” said Mike Gehringer, MidAmerican’s vice president of renewable energy.